Fast Company magazine features an article by columnists Chip Heath and Dan Heath that proposes a counter-intuitive approach to problem solving, especially when the problem is one of significant size. Find a bright spot and clone it. That's the first step to fixing everything from addiction to corporate malaise to malnutrition. A problem may look hopelessly complex. But there's a game plan that can yield movement on even the toughest issues. And it starts with locating a bright spot -- a ray of hope. As the City of Los Angeles grapples with a budget crisis that calls for complex solutions of revenue enhancement, of systemic efficiencies, of budget cuts, and of staffing reductions, I looked to our neighbors for that "Bright Spot" and I found Long Beach. Long Beach and Los Angeles compete for the same money and yet somehow Long Beach seems to come out ahead of LA. 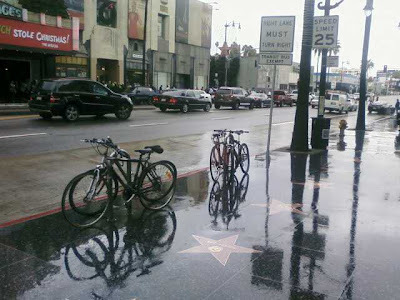 For example, LA and LB both submitted proposals to the Metro during the Call for Projects, asking for money to install bike racks on sidewalks throughout the respective cities. Both Long Beach and Los Angeles were awarded money but Long Beach's award exceeded LA's by a factor of 40 to 1 per capita. The result is that Long Beach received money from the Metro's Call, paid their Public Works employees to install the bike racks, and went to work improving the quality of life in their community. Meanwhile, Los Angeles took the smaller award, gave it to a contractor, decided that supervising the contract was too much work and suspended the program, citing the budget crisis as the cause. Long Beach put their city employees to work with a well-funded program, Los Angeles churned paper and folded. There are a couple of Bright Spots here that should serve as "Rays of Hope" as we look for long-term solutions to the budget crisis. Long Beach filed ambitious requests for funding. The project is simple, the installation of inverted-U bike racks, but the request was comprehensive and it did three things; it put people to work, it served as a traffic congestion solution, and it contributed to a street revitalization program. With half a million residents, Long Beach has a population one eighth the size of LA but they asked for five times as much as Los Angeles (40 to 1 per capita) and they prevailed because they had the audacity to think big and to go to work. It took no more time or energy or paper to ask for the larger amount of money. It took a simple commitment to actions that resonate. A bike rack may not seem like a comprehensive solution to our budget crisis but if installing them puts people to work, if the money to pay people to install them is there for the asking, why aren't we putting in more bike racks? Is it time to shift from a problem focus to a solution focus? is it time to look for flashes of success? We can deliberate, we can pontificate, and we can negotiate but if we want to change course, it's important that we look for success stories and bright spots, then we must duplicate them. LA City Council - "Failure to Deliver"
LA's Best Bike Plan - The plan with a Backbone!